This is not a radioactive fluid spill! 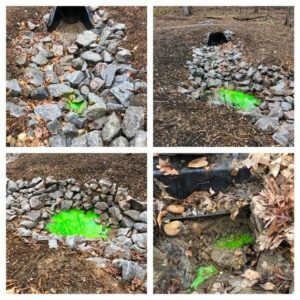 We just used a fluorescent green biodegradable dye to see if water was flowing under, rather then through the culvert. It turned out that water was flowing under the pipe through the gravel setting bed. We have more dye left if you need to know where water is coming from or going to.